Staffshift allows candidates more control of their work with A24 Group. This service offered by our international divisions of the A24 Group, is in the process of extending to all divisions. Visit our international websites for details. 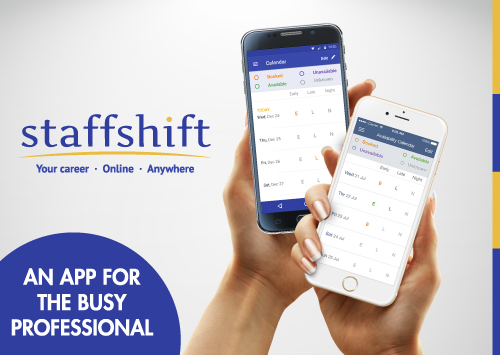 Staffshift enables candidates to log into a secure online portal and view relevant shift requirements, compliance needs, update your records, and also leave comments and feedback about assignments and our services. Once you are registered, at any time you can log into Staffshift portal, with a unique password, and let us know your availability for work. With Staffshift you can check any outstanding matters relating to your work status with us, ask a question - or just tell us what's on your mind! Staffshift also helps us to find out more about you; the sort of work that you want, where you want to work, your availability, qualifications and experience. We can then ensure that you meet the regulatory requirements that we are obliged to adhere to when we place staff with healthcare service providers. Features of Staffshift include diary reminders that you can set to remind you to update your availability each week.